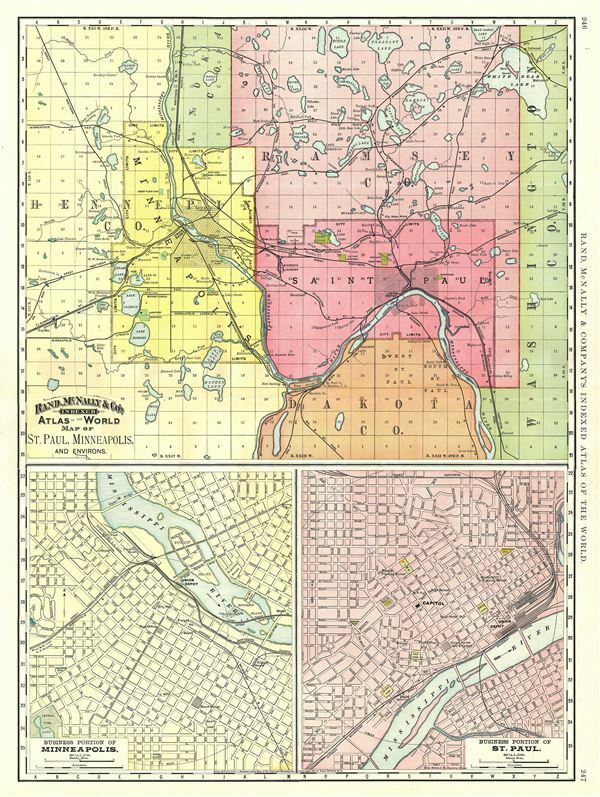 Map of St. Paul, Minneapolis, and Environs. A beautiful 1891 Rand McNally and Company map of St. Paul and Minneapolis, Minnesota. Divided into three parts, the top half of the sheet features a map of St. Paul, Minneapolis and environs. It covers from Hennepin County to Washington County, and notes lakes, railway lines, rivers, and other topographical features. The map also delineates survey grids and plats referencing the work of the U.S. Land Survey. The map on the lower left quadrant of the sheet features the business portions of Minneapolis, while the map on the lower right details the business portions of St. Paul. Both the lower maps note individual streets, important buildings, parks, rivers, and other important landmarks. This map was issued as plate nos. 246 and 247 in the 1893 edition of Rand McNally and Company's Indexed Atlas of the World- possibly the finest atlas Rand McNally ever issued. Rumsey 3565.124 (1897 edition). Philips (atlases) 1026 (1898 edition).